From pristine private clubs to premier public courses, the story of Palm Springs' influence on the golf world reads like a living library of modern play. Countless presidents and celebrities have walked the fairways at Indian Canyons Golf Resort. The deep history of professional tournament golf in the valley can be first traced to the celebrity-laden grounds of the desert's first 18-hole course, Thunderbird Country Club in Rancho Mirage, which hosted its eponymous Invitational in 1952. In 1960, the tournament would evolve into a PGA Tour stop (Palm Springs Golf Classic) before adopting its longtime affiliation with Bob Hope five years later. The event would be attached to the Hope moniker until 2012, when it became the Humana Challenge in partnership with the Clinton Foundation. Along with its pro tourney roots, Thunderbird hosted the Ryder Cup in 1955 (won by the Americans), as did nearby Eldorado Country Club in 1959 (also won by the Americans. 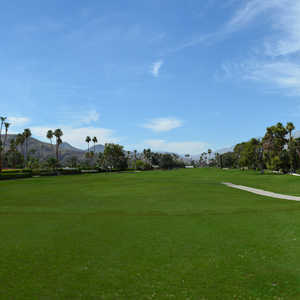 The desert's reputation as a Hollywood playground was further enhanced at Canyon Country Club in Palm Springs. Presidents (Dwight D. Eisenhower, Lyndon B. Johnson, Ronald Reagan and Gerald Ford), celebrities (Jack Benny, Bob Hope, Jackie Gleason, Clark Gable, Milton Berle and Johnny Carson) and Rat Packers (Frank Sinatra, Dean Martin and Sammy Davis Jr.) enjoyed the Donald Wexler-designed clubhouse and Billy Bell-drawn fairways, which play today as the North Course and South Course at Indian Canyons Golf Resort. At private Mission Hills Country Club in Rancho Mirage, the Dinah Shore Tournament Course plays host to golf's first major championship of the season (today known as the ANA Inspiration). Known for its victor's "leap" into Poppie's Pond adjacent to the 18th green, the course has annually hosted the LPGA since 1972 and became a major in 1983. Aside from the Masters, the ANA Inspiration is golf's longest-running event continuously held at the same locale. Private play turned pro canvas can be further traced to the Tom Fazio-designed grounds of The Vintage Club, where its Invitational event is credited with creating the founding for today's Champions Tour. While the Hope/Humana has been played across more a dozen area courses, much of the pro tournament golf in the desert has been at La Quinta-located PGA West, known as "The Western Home of Golf in America." With three public plays among its six-course stable (including two more publics at neighboring sister property La Quinta Resort & Club, the region's original resort), PGA West has hosted a myriad of professional events since its late-80s debut. Among the long list of PGA West landmark events: Lee Trevino's hole-in-one on the "Alcatraz" island 17th at the public TPC Stadium Course and David Duval's Sunday 59 on the Palmer Private en route to winning the 1999 Bob Hope Chrysler Classic. For players looking to relive some of the region's storied event history, a number of public plays afford the chance. From 2006-08, the sprawling grounds of the Arnold Palmer-designed Classic Club served in the Hope tourney rotation, while Palmer-drawn SilverRock Resort in La Quinta hosted the tour stop from 2008-11. Former "Skins Game" grounds are also in play for daily-rate games at The Golf Club at Terra Lago (host from 1999-2002), The Golf Club at La Quinta (2003-06) and Indian Wells Golf Resort (2007-08). The dual-course grounds at Desert Willow Golf Resort in Palm Desert are among the finest municipal golf properties in the country. The Firecliff Course and Mountain View Course aren't simply lauded for their condition and desert routing. Noted for its environmental design, the resort was also the first golf property to be featured on the cover of Smithsonian Magazine. For less heralded but still-potent muni fun, aptly named The Lights at Indio is the desert's only course lighted for night play. And at 3,004 yards, it's also among the longest par-3 tracks in the country. Luminary course designers define the Coachella Valley. For a pair of truly unique public courses created by legends-turned-architects, check out the Nick Faldo-designed Marriott's Shadow Ridge Golf Club in Palm Desert and the Westin Mission Hills Gary Player Signature Course in Rancho Mirage. Australian Sandbelt-inspired Shadow Ridge owns the distinction of being Faldo's debut U.S. design, while Player's Mission Hills counts as a highly rare instance of West Coast work in the luminary's portfolio. Seeking timeliness and talent in your desert notebook? The Palms Golf Club in La Quinta, which is private, may be the nation's ultimate players course. With a host of playing pros and ex-jocks among its membership, the club is reputed to not only have the lowest cumulative handicap index in the country, but also has been recognized for owning the nation's fastest pace of play. Running more than 3 hours and 30 minutes? That may just cost you playing privileges. I have a cushman cart, told about 1974 when there was One club about that time that had all their carts with Cadillac Grills. I've been trying to find information on them, how many, what club, supposedly Bob Hope era..They had odd shaped leather covers with fringe, ice chest on board, fans, lights, etc. If you have any interest or any information or want a picture or two, ask and I'll send. I appreciate any information you may have regarding this.